After a whirlwind year of successes, which saw the Maxwell Quartet crowned as 1st prize winners at the 9th Trondheim International Chamber Music Competition and the release of their debut album on Linn Records, the Maxwell Quartet’s Scottish heritage gives them a truly unique flavour, which transcends the boundaries of musical genres and encourages a whole new generation of audiences to attend their concerts. Hailed by Classical Music Magazine as “one of the front-runners in young chamber music groups in the UK”, the Maxwell Quartet is now fast developing a reputation as one of the leading young string quartets in the world, whose performances excite and astound audiences in major venues both in the UK and internationally. 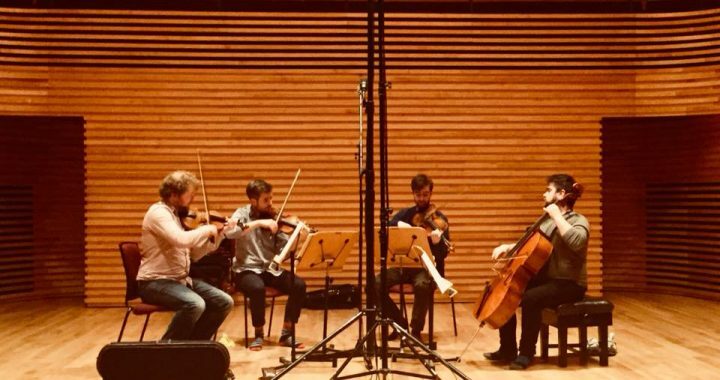 In addition to tours of Japan, the USA and China, the quartet now regularly performs at London’s Wigmore Hall, St Martin in the Fields, Purcell Room and more. In addition to their busy performance diary, the Maxwells are excellent communicators in the educational sphere, and enjoy a busy schedule of workshops and educational projects; they are regular guests for Paragon ensemble’s educational programmes and Children’s Classics Concerts. Where possible, they like to give daytime workshops in local schools when on tour throughout Scotland.